Moxie and I took a road trip all the way to Phoenix last week. We had a blast. The drive is beautiful, easy, and fun. 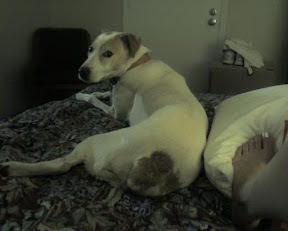 Moxie is so happy to ride along, and happier still to be able to get on the bed at the hotel. I split the drive into two 6 hour drive days. I had (awesome) coffee with a friend and his dog Nanners in Fontana on my second leg of the drive on the way in to Phoenix. I visited my brother, his wife, and three doggies in Phoenix. I also visited with my cousin Jenna and her hubby Lance. Another couple I just met also joined us for TDay dinner. It was kickass and I even got a moist maker sandwich to go, for the road. I left Friday morning, sharing linner (it was 3 ish) in Fontana (again) with yet another friend who drove over from Tustin to meet me on my way up to Victorville, my halfway point. I had two books on CD to listen to, "Magical Thinking" and "Oh Pioneers!" and two CDs of Fawlty Towers. They made the drive even funner. My camera took okay pictures, but on the upload via my Treo to Picasaweb, they turned to poop. Now that I'm back all I can think of is my next trip, to London. I'll be there in 25 days. Pip pip. Mmmmmm, I'm drinking a cup of that awesome coffee as I write this. Hug to you and an ear scratch and a kiss to the Mox.